Three council members want to see if more craft brewers can be accommodated in Long Beach. An item placed on Tuesday’s agenda by Vice Mayor Robert Garcia, Councilwoman Suja Lowenthal and Councilman James Johnson asks for City Manager Pat West to report back in 90 days on the city’s licensing and zoning policies for micro-brews and brew production, engage the local brewing community and examine best practices in other cities, including San Diego and Torrance. Long Beach currently has three “brewpubs”: Beachwood BBQ and Brewing and Rock Bottom Restaurant & Brewery downtown, and Belmont Brewing Co. in Belmont Shore. Stumbled across this event recently: Beats and Brews at Luna Supper Club in Pomona. It’s scheduled to take place from 6 to 9 p.m. Saturday, February 15, at the nightclub, 3220 W. Temple Ave.
It’s being billed as “half beer festival and half music experience,” as guests will be able to sample unlimited pours while listening to music from DJs. 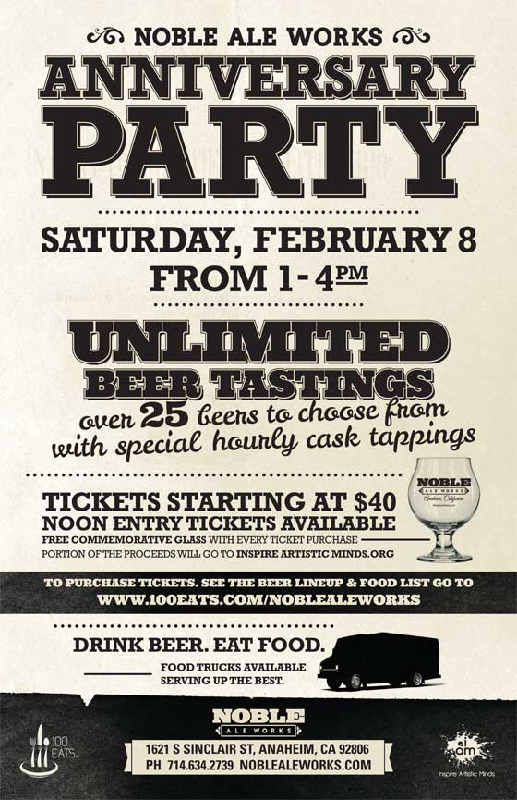 Anaheim’s Noble Ale Works will celebrate its third anniversary this Saturday (February 8), with 30 different brews (with hourly cask tappings), a bunch of food trucks and music. Presale tickets (sales end today, February 6) start at $40 for general admission and end at $50 for V.I.P. admission. Prices will be $20 more at the door. Tickets include entrance, a tasting glass, unlimited tastings and a raffle ticket. General admission ticket holders will be allowed in from 1 to 4 p.m. Those with V.I.P. tickets will be allowed in at noon. Inland Empire Brewing Company will celebrate its fifth anniversary on March 1, but is offering a special discount on its website that expires today (February 4). Tickets, regularly $40, can be purchased for just $25. Tickets include 15 beer tasting tickets. 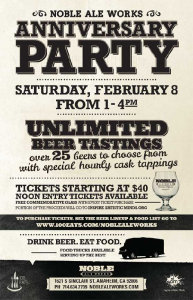 Additional tasting tickets will be available for $1 each at the event. In the past the brewery has offered discounts through Groupon, but not this year. The event will run from 1 to 5 p.m. (V.I.P. ticket holders get in an hour early and get five additional tasting tickets for an extra $10) at the brewery, 1710 Palmyrita Ave., Suite #11, Riverside. A portion of the proceeds will benefit Come as You Are Homeless Ministries. Click here to purchase now. True, we haven’t had much of a winter here in SoCal, so it’s nearly apropos that Redlands’ Hangar 24 Craft Brewery is celebrating spring on the first day of February. The brewery is rolling out its seasonal California Spring Beer with a daylong event that features music, food and, of course, lots of beer. Tweets about "#beer near:"los angeles, ca" within:15mi"